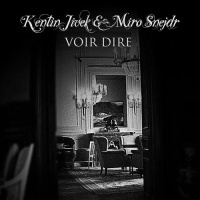 Voir Dire is the result of a collaboration between French singer-songwriter Kentin Jivek and Slovakian pianist Miro Snejdr. It features the heavily accented voice of Kentin Jivek and the classical piano score of Miro Snejdr. As it is sung in French, its appeal may be limited but Voir Dire is in very much in the European tradition drawing upon jazz and classical with occasional forays into cinematic and experimental terrain. Kentin Jivek's roots are in neo-folk but he has transcended this with releases dipping into psych folk and ambient folk. Miro Snejdr records as Spitting At Pigeons and is part of the sea shanty folk duo Folk Grinder, his piano dexterity found its way to Douglas P. of Death In June and achieved many plaudits for his piano scores on Peaceful Snow and the instrumental Lounge Corps transcribing the acoustic guitarwork of Death In June into piano instrumentals. Voir Dire is their first collaboration and it picks up on both their individual musical styles. Voir Dire takes some time to warm up and find its feet but when it does it has some moments of understated beauty. Before that though we have Jivek's sombre and yearning tones stretching over the piano and accordion chime of 'Communication', while 'L'effet Domino' foregoes the piano in favour of plain guitar strum, keyboard throbs and shakers. It's all quite low key until the cinematic melodies of 'Le Nombre D'or' where the piano is draped in strings as Jivek's voice moves from sung to spoken in this quietly appealing song. 'Le Temps Ne S'offre Pas' follows a similar path with Jivek's voice shadowed by strings and Snejdr's tender piano score, often cutting to just voice and piano. I've yet to hear Jivek's solo releases but Snejdr's arrangements although sparse, really lighten the overall gloomy atmosphere. Voir Dire really comes into its own when they open up the sound allowing other influences to seep through as they do on 'Pair Et Face' where Jivek's voice attains a crooning quality over jazz inflected tinkering keys, accordion and brushstrokes. The entire track brings to mind the duo performing in a late night Parisian club. The sound here, like much of Voir Dire, seems timeless. It could be now, it could be the sixties or it could be set in a post war smokey club. Both 'Souffler' and 'Comme Une Comete' allow Snejdr to produce beautiful piano settings similar to those that featured on the Death In June releases Peaceful Snow and Lounge Corps. 'Souffler' though, carries with it passages of rippling guitar notes and accordion drone, while 'Comme Une Comete' is much more song based fleshed out with percussion and Jivek's expressive vocalisations. There's a moment of experimental drone at the start of the closing track 'Je Suis Un Nomade' before it settles into trebly guitar accompanying Jivek's vocal, at points surrounded by bird song but it's 'Et Amon Ra Aussi' which could be regarded as the centrepiece here, beginning as it does with loose guitar chords and voice, before picking up percussion and then piano, moving into passages of silence and spoken word before returning to the piano and percussion. The entire track is a distillation of the distinct contribution of the collaborators.